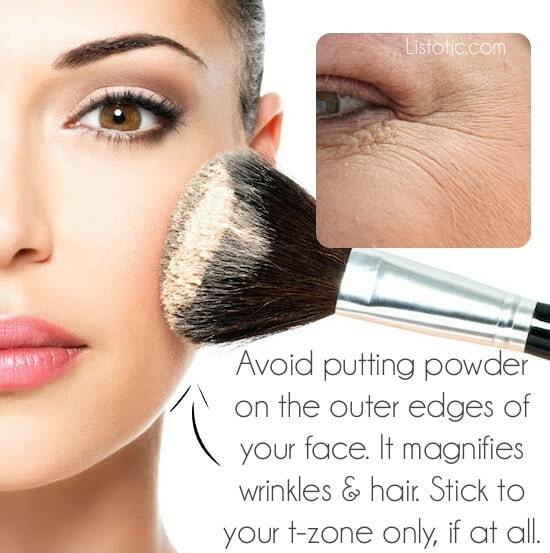 Face powder is great for locking in your makeup and getting rid of shine, but this stuff can really age you! It magnifies wrinkles and any hair/peach fuzz you may have. Most women don’t need face powder at all, but if you like to use it to keep the shine down (I use these), use powder on your T-zone only (nose and forehead). As you get older, it should become less and less part of your morning makeup routine. Waterproof mascara is great for the obvious reason that it stays in place all day, but it’s also a lot harder to remove and has more chemicals than you would probably care to know about. Not only does the everyday process of applying and removing it take a toll on your lashes, but the list of ingredients can cause your lashes to slowly wither and die. In short, save your waterproof mascara for the summer months only, and only on days where you think you might need it. Most of us use the unnatural light from our bathroom mirror to apply makeup every morning. And this is fine if you’ve already applied and tested your makeup by a window, but if you haven’t taken a look at your makeup lately somewhere other than your trusted bathroom mirror, you might want to get on that. Some of you may be surprised to see that your foundation, eyeshadow, or lipstick isn’t quite as flattering as you had hoped.